We’re officially in the last week of August and I can’t believe summer is coming to a close! I am looking forward to one more summer vacay this weekend but after that, I’ll officially be in fall mode. Today I’m sharing a business casual look that’s perfect to wear to work as we wind down from summer and transition into all things fall. The other week I was browsing in J.Crew and spotted this little ruffle sleeve top. 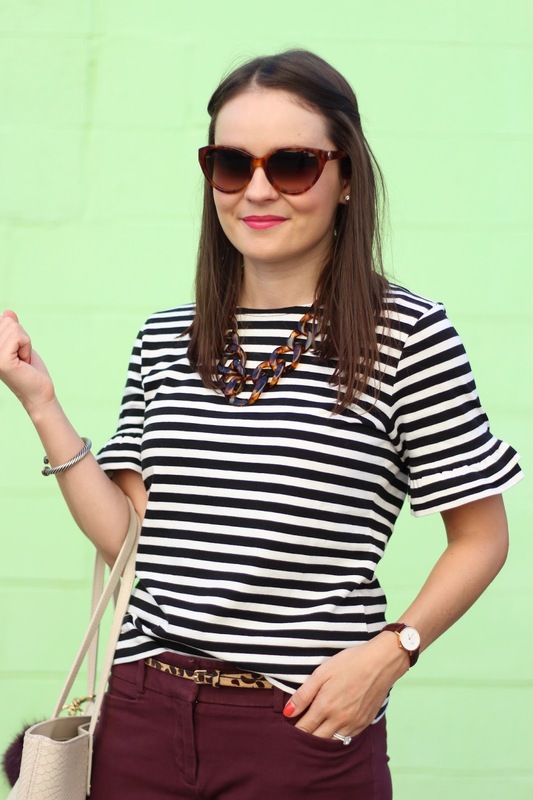 I grabbed it because 1) I love stripes and 2) it’s the perfect transitional top. The material is a little thicker so it’s dressier than a t-shirt and it stays wrinkle-free. 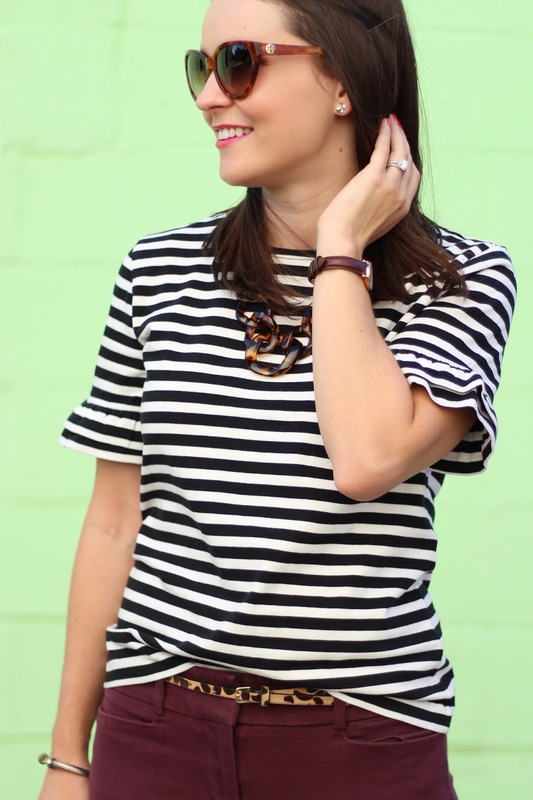 We all have striped tops but the sleeves on this one give it a little something extra. Pair it with denim shorts now and a wool skirt as the temps drop. I wore it with a pair of colored cropped pants and a hint of leopard to slowly introduce some fall vibes. It also comes in a bright blue stripe if black just isn’t your thing. A good, sturdy tote is also a must-have for work and I have loved carrying my GiGi ‘Mini Taylor’ tote ever since my girlfriends got it for my PA school graduation. I don’t love huge totes and this one is the perfect size to fit everything I need on a typical day (even my MacBook Air). And notice my furry little accessory? I know these poofs have been around for a little while but I just recently got this one at TBScon and it will definitely be tagging along with me this fall! I had a pretty laid back weekend and yesterday Ryan & I did some exploring in South End. Our pizza & ice cream date somehow turned into an apartment search since we’re about to put our condo on the market. Timing with selling our current place and closing on our new home would be pretty hard to predict so unfortunately it looks like we might have to move twice. Ugh. But… we did drive by our construction site and we now have a third floor! I’m loving the progress and am ready for some furniture shopping already. We browsed West Elm yesterday and I could honestly take one of everything! Thank for reading & have a great Monday! Such a great look! Just picked up a pair of pants in the same color that I can't wait to play around with. I just love this whole look! 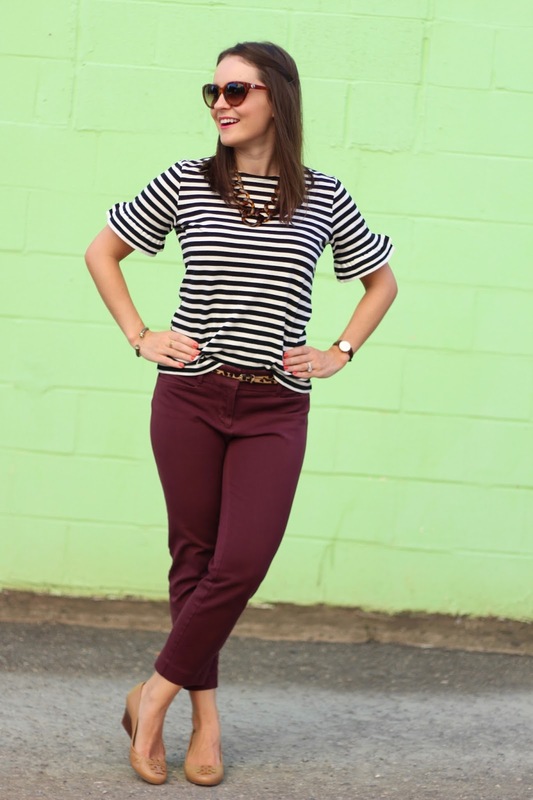 I'm definitely on the hunt for some great colored pants this fall and I'm loving these!! So cute! Definitely need that top in my closet! I really like the belt with those pants. Color/pattern are so great together. This whole outfit is on point! I wouldn't normally pick that necklace, but I actually like it a lot. I love this whole look! I would have never thought to pair the necklace with that top and it looks great! 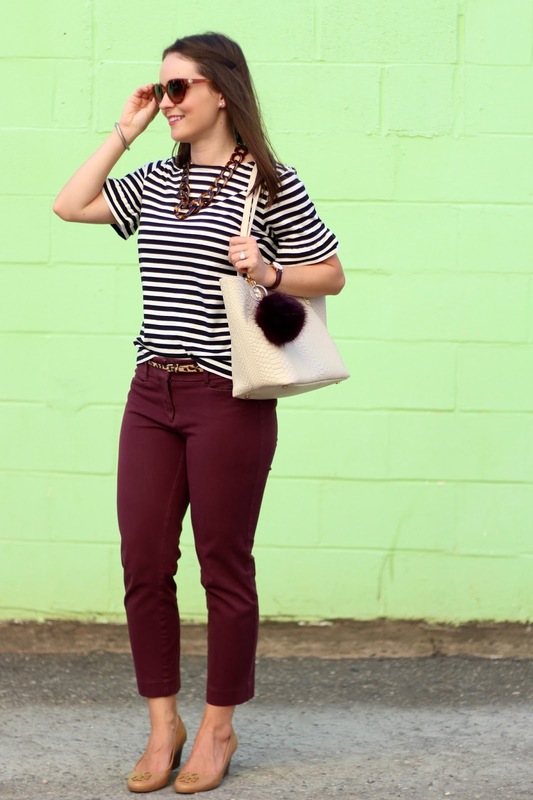 I love everything about this fall look! I hope fall gets to Louisiana soon! This is my idea of a perfect outfit! Seriously so cute and I cannot waiiiiit for Fall!!! I love this look, especially those pants! Loving the necklace and belt you paired with this too. Such a gorgeous top! I love the stripes and the sleeves! I love the sleeves on that top!! Cute outfit! 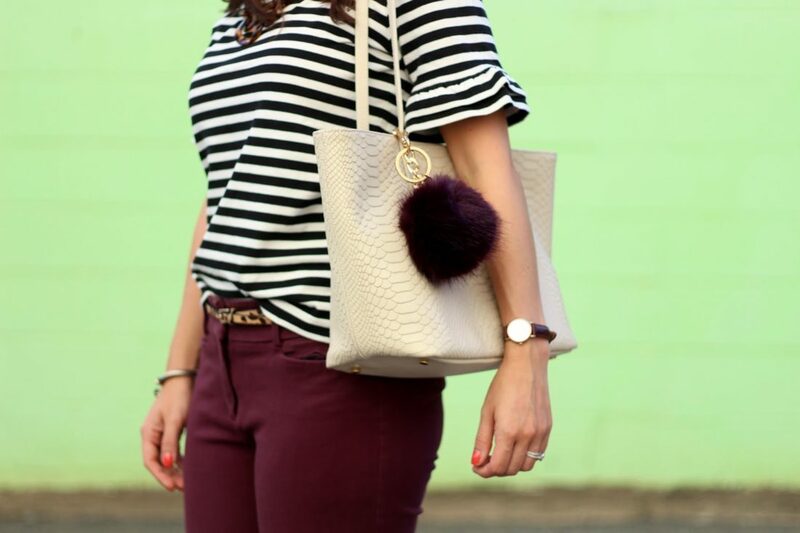 This is such a cute pairing and perfect for transitioning into fall! 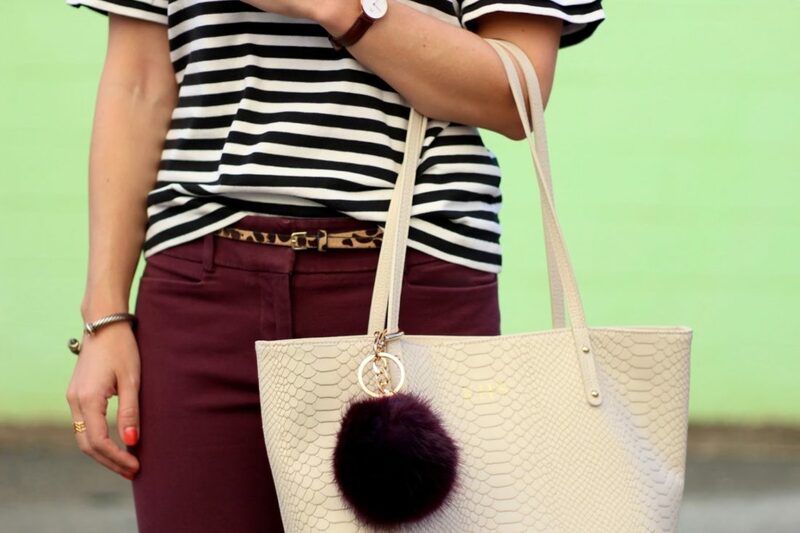 I love classic stripes paired with leopard, it's such a chic duo and both look great paired with burgundy, one of my favorites come fall! Thanks so much for sharing and I hope you have a great week ahead, beauty!